Macular Degeneration is the number one cause of legal blindness in people over the age of 60. The most common form is refered to as Age-Related Macular Degeneration (AMD or ARMD). There are other, rarer forms of Macular Degeneration, but here we will concentrate only on the age related form. The risk of Macular Degeneration significantly increases with age. In fact, people between the ages of 64 to 74 have a one-in-four chance of developing the disease. Many seniors already have the Macular Degeneration and don’t even know it. A visit to your eye doctor is your greatest defense in helping to preserve your vision. The eye acts like a camera, with light passing through the clear structures in front of the eye, cornea, and lens, and focusing at the back of the eye, specifically on the retina. The retina acts like film in the camera, turning light into impulses that travel up the optic nerve to the brain. The brain then interprets these impulses and that’s how we see. A specialized area of the retina called the macula is what allows us to see detailed, central vision. ( Examples of centralized vision include recognizing face, reading, or watching television.) The rest of the retina is responsible for peripheral, or side, vision. It cannot see detail like the macula. In Macular Degeneration the macula is damaged – that results in extreme loss of central vision. Since the peripheral retina is not involved, Macular Degeneration does not lead to complete blindness. Research has not yet uncovered the cause of Macular Degeneration. The disease is frustrating for both patients and doctors because there still are very few treatment options and no known ways to prevent the disease.Macular Degeneration can hide without any obvious symptoms. If the disease affects one eye, your other eye can compensate for the vision loss. This means you may not notice the loss until it becomes very apparent. There are other risk factors besides age that can lead to Macular Degeneration. Your chance of developing Macular Degeneration more than doubles if you smoke or have smoked in the past 15 years. In addition, research has shown that Caucasians tend to get the disease more often than other races. If you have relatives with Macular Degeneration, you also have a higher risk of developing the disease. Knowledge and understanding of the disease may help save your vision. Macular Degeneration is a serious disease that you may be able to combat if it is diagnosed early. Wet Macular Degeneration – The Wet, or Exudative, form of Macular Degeneration is responsible for up to 90% of the severe vision loss associated with this condition. Wet Macular Degeneration is caused by the growth of new abnormal blood vessels from the choroidal neovascularization (CNV). These abnormal blood vessels first leak fluid under the macula, then form scar tissue leading to central vision loss. Pigment Epithelial Detachment, or PED, is another form of Wet Macular Degeneration. PED is a blister of fluid that forms in the macula causing blurring or distorted vision. Laser treatment may be recommended to correct this condition. Since Macular Degeneration is painless and can cause very subtle changes in vision, getting regular exams from an eye care professional is the only way it can be diagnosed. One of the earliest changes seen in Macular Degeneration is distortion of straight lines. This is a serious change and should be evaluated by your eye care professional immediately. It’s important to schedule regular eye exams at least once a year and to see your doctor immediately if you notice any change in your vision. When you make an appointment to see your eye care professional, ask if they test for Macular Degeneration. If drusen or other early signs of Dry Macular Degeneration are present, your doctor may ask you to use an Amsler Grid to monitor your vision. The Amsler Grid is a simple test that can effectively identify changes in your vision. To get an idea of how it works, take a look at the Amsler Grid examples. It is important to understand that Dry Macular Degeneration can convert to Wet Macular Degeneration. A person with advanced or Wet Macular Degeneration may see distortions in the grid pattern, such as bent and irregular lines, and/or gray, shaded areas. If changes on the Amsler Grid are seen, it’s time to seek examination immediately. To be effective, follow your eye care professional’s instruction on how to correctly use the Amsler Grid. the photos. Your doctor will use this test to guide treatment; therefore, it may need to be repeated before any future treatments. Your doctor may also take color photographs of your retina for comparison at future visits.It is important to remember that even in severe cases of Macular Degeneration, patients do not lose their peripheral vision. These patients often learn to use their peripheral vision to look slightly off-center to make out details. There are also special vision aids that can assist people with severe vision loss. Your eye care professional can help. What are my treatment options if l have Dry Macular Degeneration? 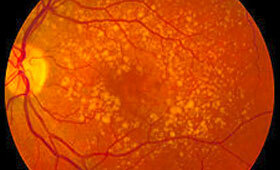 There are no treatments for Dry Macular Degeneration. However, a ten-year National Eye Institute sponsored study, AREDS (Age Related Eye Disease Study), has shown that antioxidant vitamins and zinc may reduce the impact of Macular Degeneration. AREDS found that people with advanced stages of Macular Degeneration lowered their risk of vision loss by 25% when treated with a high-dose combination of vitamins A, C, E, beta-carotene, and zinc. For those who have very little or no Macular Degeneration, the special supplements did not appear to have any benefit. Remember that these vitamins are not a cure. They will not restore vision and may even be harmful. For instance, large doses of antioxidants may have a negative effect on some people with some medical conditions. These vitamins and minerals should be prescribed by an eye care professional in specific daily amounts and be taken as supplements to a balanced diet. Be sure to meet with your eye care professional to learn if you’re at risk, and whether supplements would help. If I have Wet Macular Degeneration? Wet Macular Degeneration needs to be treated as soon as it is discovered. Waiting will only lead to further vision loss. There are two treatments available for patients with certain forms of Wet Macular Degeneration. One treatment is laser photocoagulation. While this process cannot restore lost vision, it seals the abnormal blood vessels. This prevents further vision deterioration in certain types of Wet Macular Degeneration. In laser photocoagulation, a laser is used to destroy the abnormal blood vessels under the retina. Since the heat of the laser also destroys overlying healthy retinal tissue, a permanent blind spot will result anywhere the laser is applied. Thus, laser photoco-agulation is useful if the abnormal blood vessels are not in the center of vision. If they are in the center however, laser to this area will lead to permanent loss of vision. Fortunately, there is a way to treat abnormal blood vessels in the center. It’s called Visudyne® Therapy. Approximately half of all patients treated with laser photocoagulation will require retreatment, as abnormal blood vessels may return, immediate vision loss and formation of a blind spot in vision are normal occurrences with this treatment. It should be noted that this vision loss is significantly less than what would be experienced if the condition were left untreated. Even with Visudyne Therapy there may be some loss of vision. However, it’s less severe than laser photocoagulation or no treatment at all. Visudyne Therapy cannot restore lost vision. In Visudyne Therapy, a light-activated drug known as Visudyne (verteporfin for injection) is injected into the bloodstream. The drug travels in the bloodstream and collects in the abnormal blood vessels, where it is activated by a non-thermal laser (a laser that does not burn the retina). This produces a reaction that closes the abnormal vessels without causing damage to the overlying retina.Visudyne Therapy is a multi-course treatment. The desired result cannot be achieved with just one or two treatments. Multiple treatments are necessary because leakage often reoccurs and the abnormal blood vessels may return after treatment. However, Visudyne can be reapplied at up to three-month intervals, if necessary. A typical treatment schedule for eligible AMD patients is three treatments in the first year, two times in the second year, and one to two treatments in the third year. Transpupillary Thermotherapy (TTf) This therapy uses a low-intensity thermal laser to potentially treat abnormal blood vessels. Submacular Surgery In this procedure, a physician surgically removes abnormal blood vessels. Macular Translocation This procedure involves repositioning the retina so that the non-functioning portion is replaced with healthy retinal tissue. Feeder Vessel Therapy This treatment involves the use of special angiography equipment in conjunction with a thermal laser. The goal is to identify and then treat arteries that feed blood to the abnormal vessels. Radiation Therapy This is used in certain medical applications to stop the formation of blood vessels. The goal is to use radiation to halt the growth of abnormal blood vessels. What can I do to protect my sight from Macular Degeneration? Get your eyes checked regularly and contact your eye care professional immediately if you experience any changes in your vision.